The Research Network for Latin America is organizing its fourth international symposium in cooperation with the University Center of Social Sciences and Humanities (CUCSH) of the University of Guadalajara and the Social Anthropology Research and High Educational Center (CIESAS). The organizers aim to strengthen the interdisciplinary cooperation within the framework of research on Latin America, bringing together researchers from different regions of the world. 1. Ethnicity and belonging. This thematic axis analyses collective constructions of identifications from the past until the present. It focuses not only on historical accounts but also on legal categorizations as well as on actual negotiations and mobilizations of (ethnic) belonging. 2. Belonging and citizenship in contexts of migration. Within this thematic axis the debate will turn on the relations between migration and ethnogenesis, claims of primordiality, the relationship between hegemonic and marginalized groups as well as the exclusion of immigrants by the state. Furthermore, it will address the question of how actual and past (trans)migrations create new and multiple senses of belonging and the role of language and literature in shaping them. 3. Citizenship transformations and the interweaving with ethnicity. From an historical, theoretical and phenomenological perspective, this thematic axis will examine the evolution of the concept of citizenship from the Ancient Regime to postmodernity: the historical struggle for political and social inclusion; the ‘classical’ claim of equality in view of cultural diversity; the demands for civic representation in contexts of social and cultural heterogeneity, institutional discrimination or armed conflicts. The Conferencias Magistrales have been recorded and can be watched here. An anthology resulting from the conference has been released in 2015: Potthast, Barbara; Büschges, Christian; Gabbert, Wolfgang; Hensel, Silke; Kaltmeier, Olaf (Hg.) 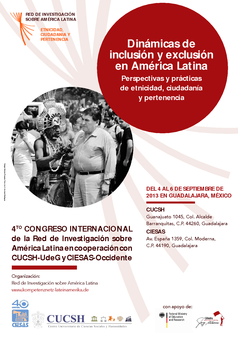 (2015) "Dinámicas de inclusión y exclusión en América Latina. Conceptos y prácticas de etnicidad, ciudadanía y pertenencia", Frankfurt a.M. (Iberoamericana/Vervuert).